MORAKOT made its second landfall yesterday. 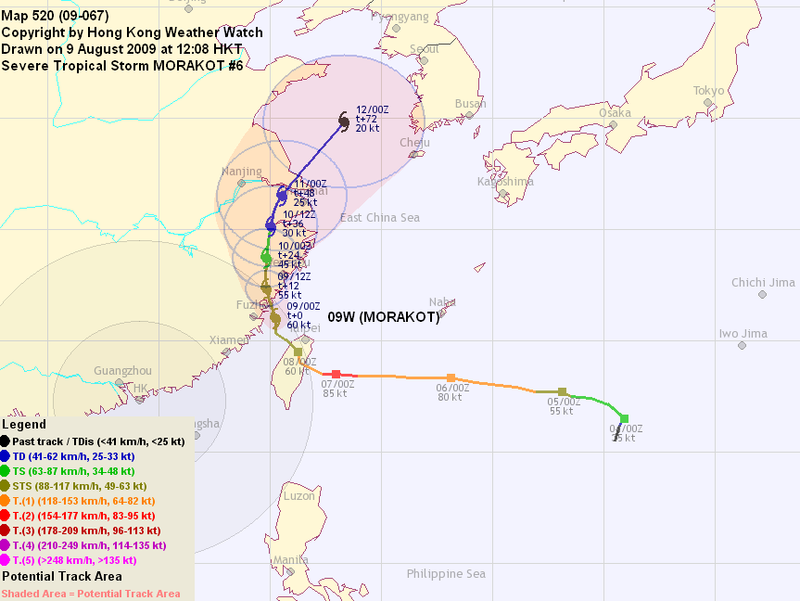 At 08 HKT, MORAKOT was centred about 110 km (60 NM) WSW of Wenzhou. MORAKOT was contributed by Thailand, meaning emerald in English. This name was last used in 2003. MORAKOT is expected to travel N then NNE in the northwestern periphery of the subtropical ridge. MORAKOT will weaken considerably in the next 24 hours. This is the final bulletin on MORAKOT. MORAKOT has turned north. At 08 HKT, MORAKOT was centred about 100 km (50 NM) E of Fuzhou. MORAKOT is expected to travel N in the western periphery of the subtropical ridge. 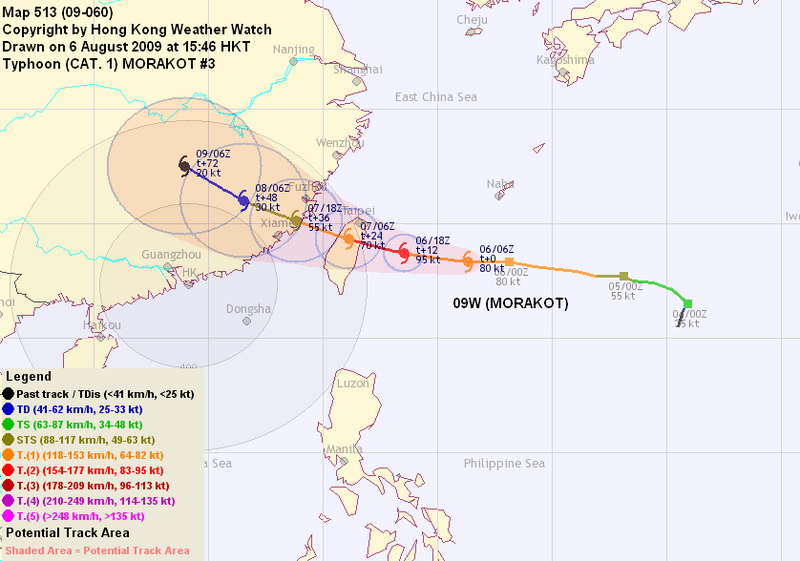 MORAKOT should make landfall in Fujian later today as a severe tropical storm. Weakening follows once MORAKOT touches land again. MORAKOT's subsidence is expected to bring very hot and hazy weather to Hong Kong today. 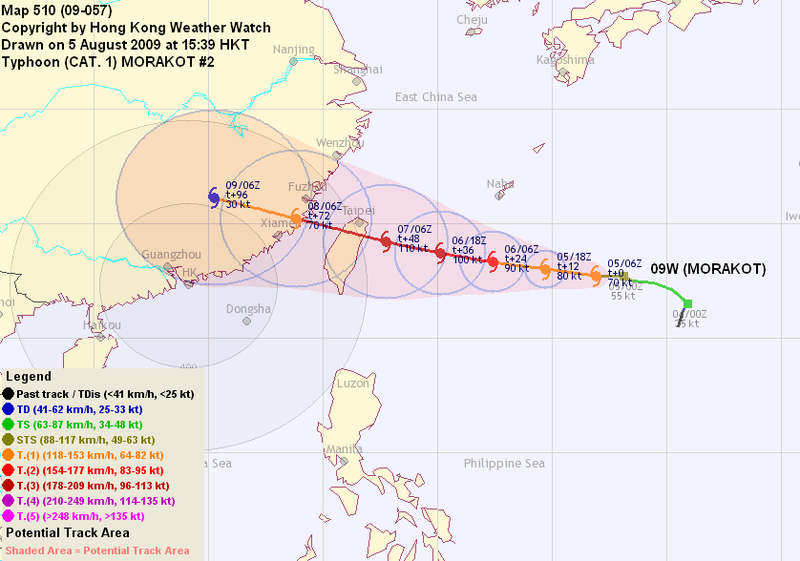 MORAKOT made landfall at Hualian near midnight today. 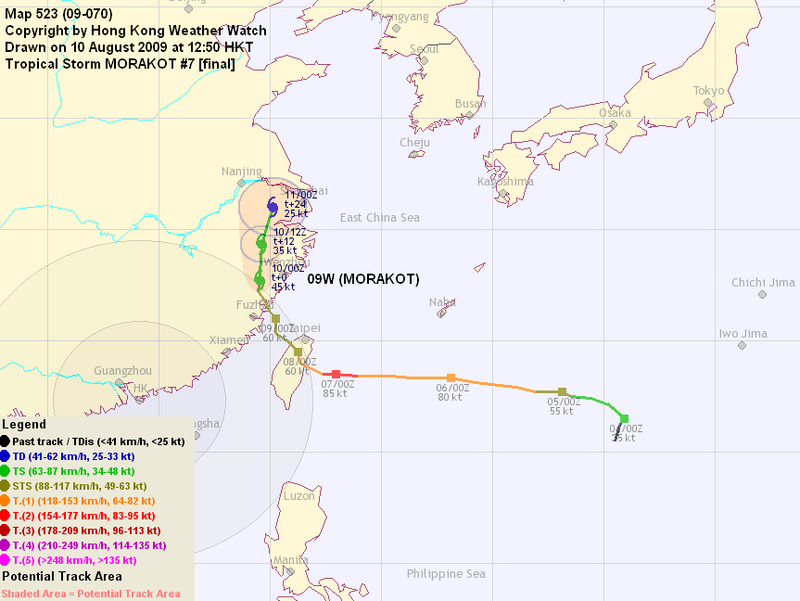 At 08 HKT, MORAKOT was centred about 90 km (50 NM) SSW of Taipei. MORAKOT is expected to travel NW turning gradually to N in the western periphery of the subtropical ridge..
MORAKOT should make landfall in Fujian tomorrow as a severe tropical storm. Weakening follows once MORAKOT touches land again. MORAKOT's subsidence is expected to bring very hot and hazy weather to Hong Kong today and tomorrow. 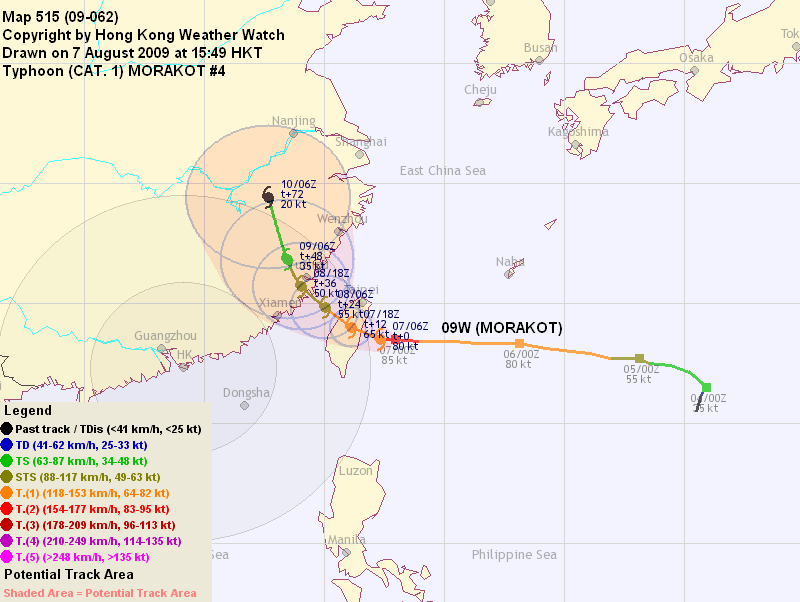 MORAKOT slowed down as it nears Taiwan. At 14 HKT, MORAKOT was centred about 190 km (100 NM) SSE of Taipei. 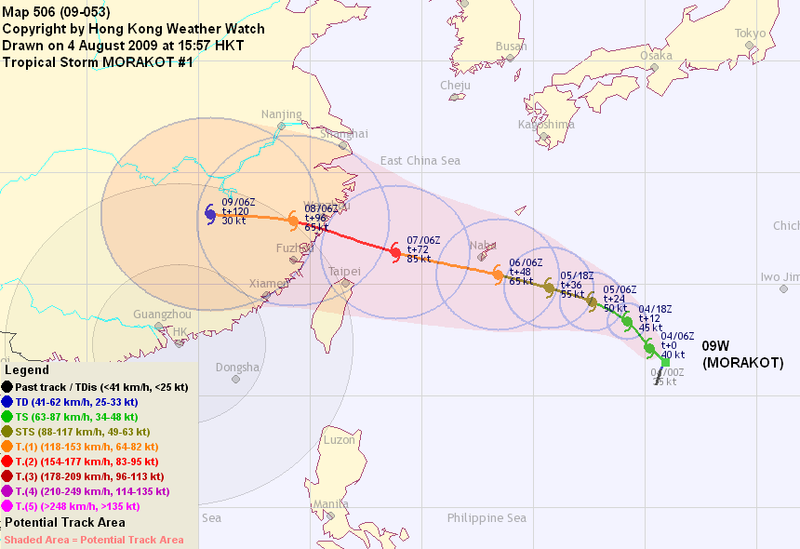 MORAKOT is expected to travel WNW towards Taiwan. Afterwards it should assume an increasingly northward track as it travels in the southwestern (turning to western) periphery of the subtropical ridge. Rapid weakening is expected after MORAKOT makes landfall. MORAKOT's subsidence is expected to bring very hot and hazy weather to Hong Kong this weekend. MORAKOT has picked up speed and is approaching Taiwan. At 14 HKT, MORAKOT was centred about 350 km (190 NM) SSW of Okinawa. MORAKOT is expected to travel WNW under the influence of the subtropical ridge north of the system. It should gradually turn NW as it approaches the southwestern periphery of the ridge. MORAKOT has been moving faster than expected, which will shorten the time available for intensification. Rapid weakening is expected after landfall. 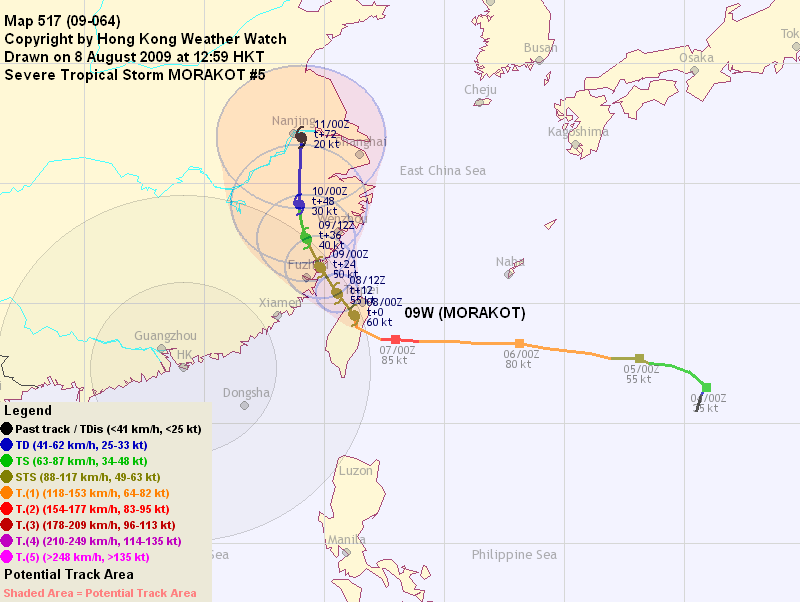 MORAKOT has turned westward and has quickly intensified into a typhoon. At 14 HKT, MORAKOT was centred about 590 km (320 NM) SE of Okinawa. MORAKOT was contributed by Thailand, meaning emerald in English. The subtropical ridge is expected to extend westward above MORAKOT and thus the storm will travel W/WNW towards northern Taiwan. Upon landfall in China it might have a chance of interacting with GONI, provided that the latter has not dissipated inland by then. MORAKOT intensified rapidly in the past 24 hours. Sea surface temperatures are quite favourable and vertical wind shear remains moderate in the seas near the Ryukyu Islands. Intensification at climatological rate or above is expected until landfall. Tropical disturbance 98W quickly consolidated into a tropical depression (09W) earlier today, and is now a tropical storm named MORAKOT by the JMA. At 14 HKT, MORAKOT was centred about 900 km (490 NM) ESE of Okinawa. MORAKOT is seen travelling north slowly due to the weak dominance of the ridge east of it over the western high pressure area located north of Taiwan (i.e. it is now in a pressure col). It is expected that after the passage of the trough near Japan, the eastern ridge will extend westward and MORAKOT will thus travel WNW towards the Ryukyu Islands. Upon landfall in China it might have a chance of interacting with GONI, provided that the latter has not dissipated inland by then. Sea surface temperatures are quite favourable and vertical wind shear is not expected to strengthen in the seas near the Ryukyu Islands. Intensification at climatological rate is expected until landfall.